I love using local transport to explore new cities. 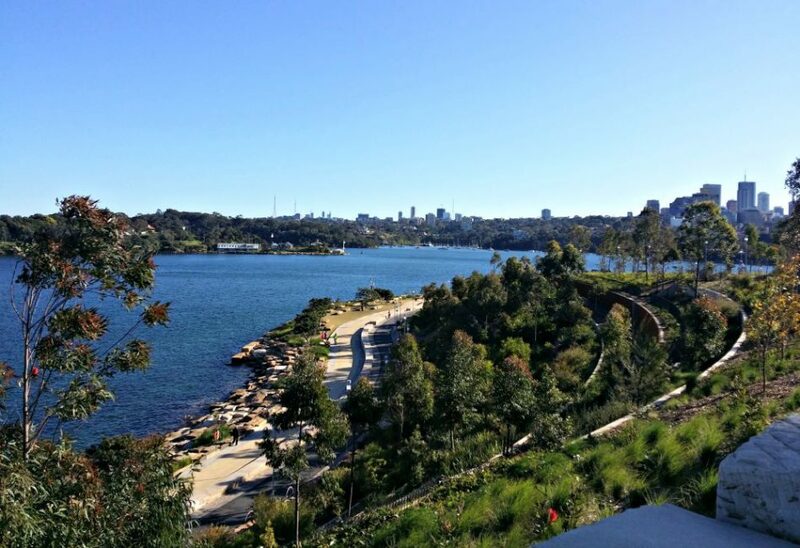 On this self-guided tour, you join locals on the 311 bus as it makes its way from Barangaroo in the centre of Sydney to the waterside suburbs of Elizabeth Bay and Woolloomooloo. Welcome to another instalment in my Exploring Sydney by Bus series, this 40-minute trip covers quite a bit of ground and is great if you want to get a little off the beaten track and discover the vibrant communities of the inner east of Sydney. 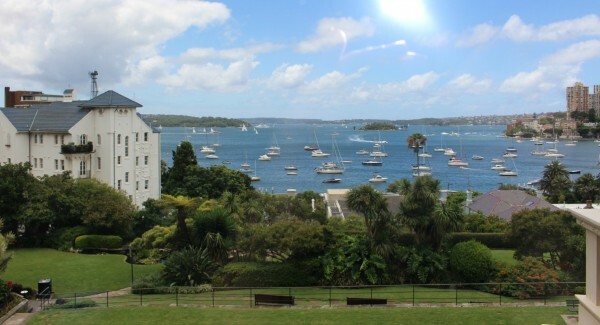 Elizabeth Bay – one of the harbours beautiful and quiet bays. So let’s begin – We are going to start from Town Hall Station you can join from Barangaroo if that is more convenient. The bus travels up Oxford Street, the main route of the Sydney Gay and Lesbian Mardi Gras, and past some popular bars and restaurants. My favourite cheap eat here is Mr Crackles – Do not click that link if you are hungry! Seriously delicious pork rolls with crunchy pork rind crackling. Worth stopping for! Wash them down with a couple of drinks from Bitter Phew right nearby. Darlinghurst Road is the epicentre of Kings Cross’s seedy past. 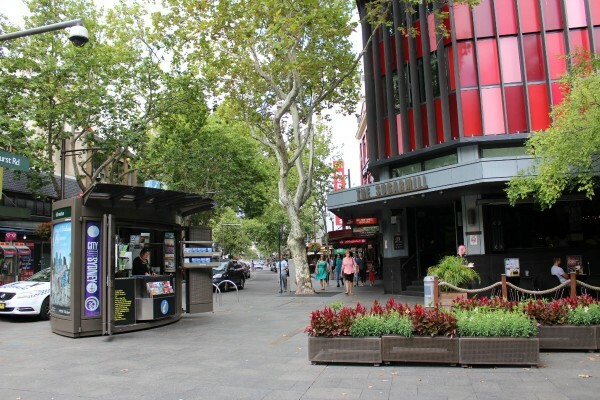 Over the last few years it has cleaned up remarkably, and during the day, it seems pretty much like any other city street with cafes, backpacker hostels and shops. The recently introduced lockout laws have seen a downturn in activity at night, but there are lots of great bars and restaurants worth a visit if you are in the mood to celebrate. 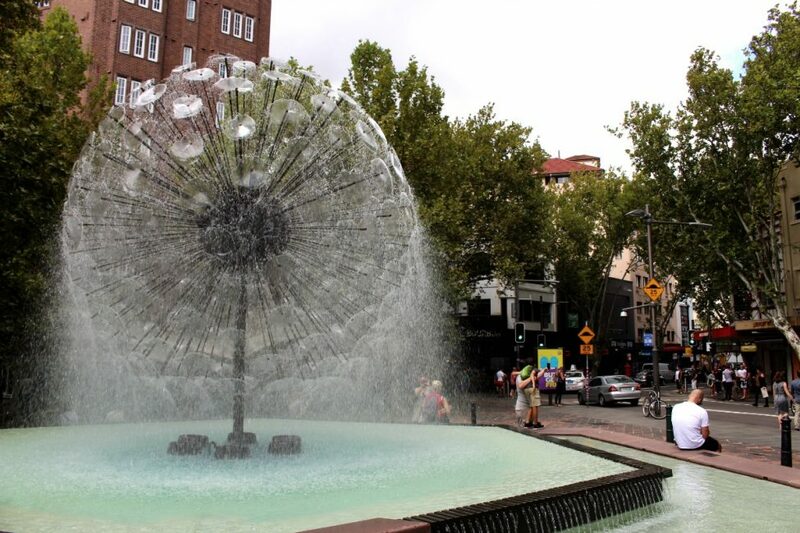 The El-Alamein fountain in Fitzroy Gardens is one of Kings Cross’s most iconic landmarks. Built in 1961, it is a memorial to the World War 2 battles at El-Alamein, Egypt and was a key work of Australian architect Bob Woodward. It is said to be the most copied fountain design in the world. If you are visiting Macquarie Street during your stay, you can find another of his fountains in the foyer of Parliament House. On weekends, the park is a hive of activity with Saturday’s organic farmers market and Sunday’s flea market. 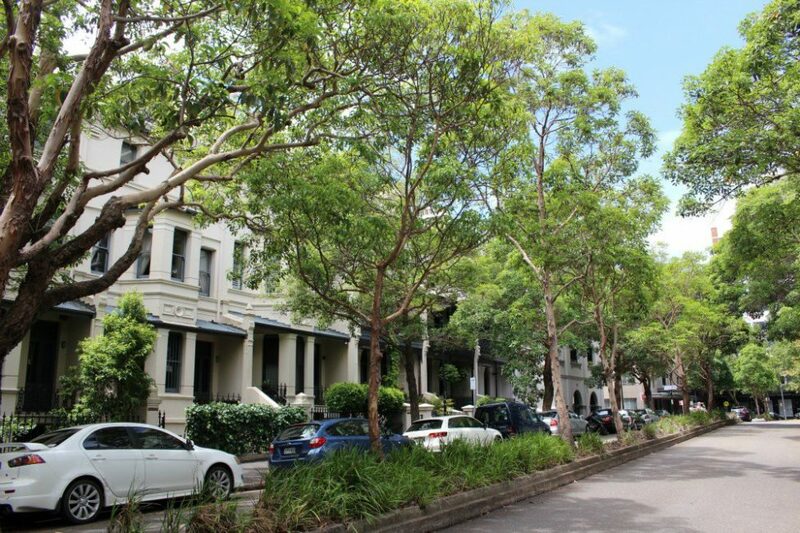 From the fountain walk down Macleay Street until you reach Greeneknowe Ave. Turn right and stop to look at the building on the corner. That is Kingsclere, Australia’s first apartment building, completed in 1912. It was designed by the same architects that build the gorgeous Dymocks Building on George St in the city. Each apartment features two bedrooms, two bathrooms and two balconies that at the time offered spectacular views of the harbour. 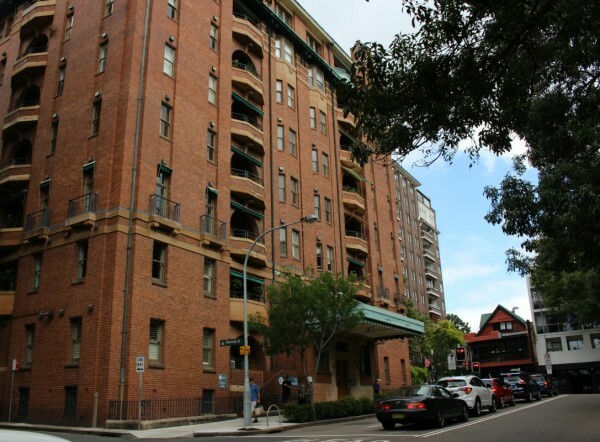 Apartments in this building have fetched over 3.4 million at auction. Head down the hill until you reach the roundabout at Onslow Ave. Turn left here, and you will come to Elizabeth Bay House. Built in the 1830s and opened as a museum in 1977, Elizabeth Bay House was the home of Colonial Secretary Alexander Macleay. 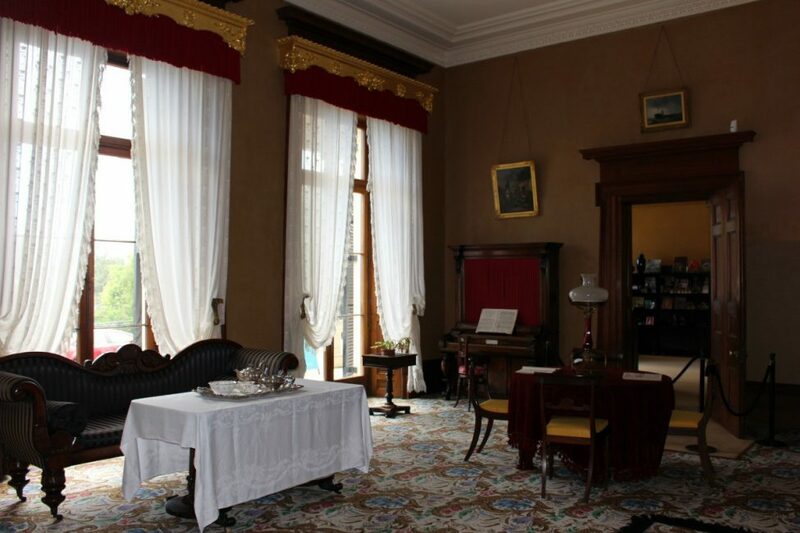 Macleay was second in charge of the colony and engaged architect John Verge to design him a grand home fitting for his family. The house features a large oval entry hall with a lovely dome ceiling and an impressive cantilevered staircase. Make sure you visit the cellar to watch the dated but fascinating dramatisation of the Macleay family’s time at the house. 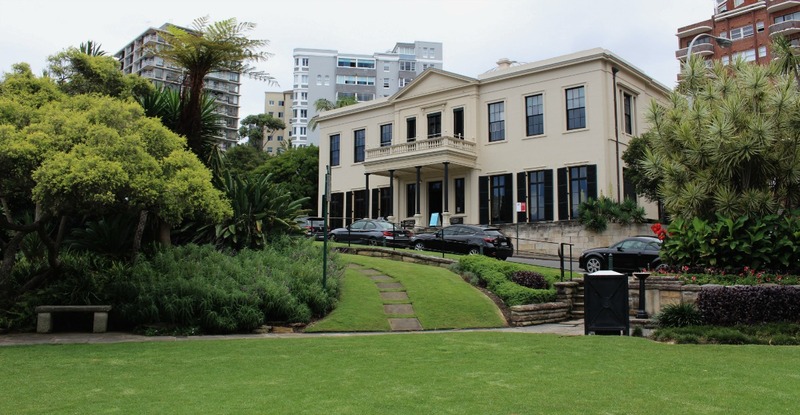 Once surrounded by extensive gardens that ran down to the harbour, today it is one of the best-preserved colonial homes in Sydney. From here head back to the road and take the stairs between 18-21 Billyard Ave to Macleay Ave. This area was the home of all things hip and happening in the 1960s and to be honest, not a lot has changed, at least, when it comes to food. Today the street is full of cafes and restaurants and is the best area on our walk today to stop for a bite or coffee. Yellow – for an interesting take on breakfast eggs and other hearty meals. Oh and if you are in the mood breakfast martinis – need I say more! 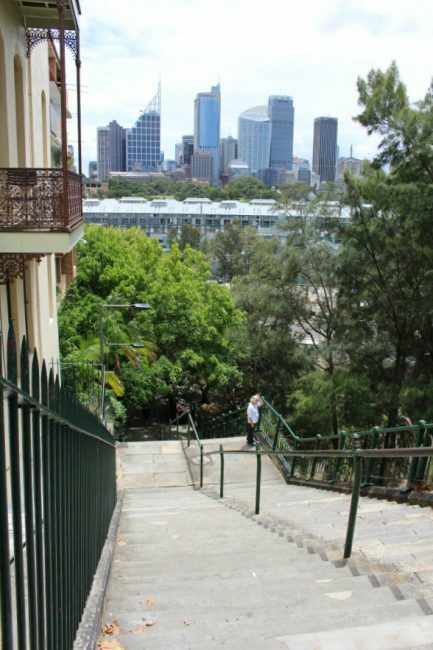 Until these stairs were built 1870, the only way direct to get between Potts Point and the slums below in Woolloomooloo was by using wooden ladders that ran down the rock face. Today the 113 stairs are particularly popular with runners who love to add them to their morning workout. Thankfully today we are walking down them. Just at the bottom of the stairs and a few hundred metres along is Harry’s Cafe de Wheels. 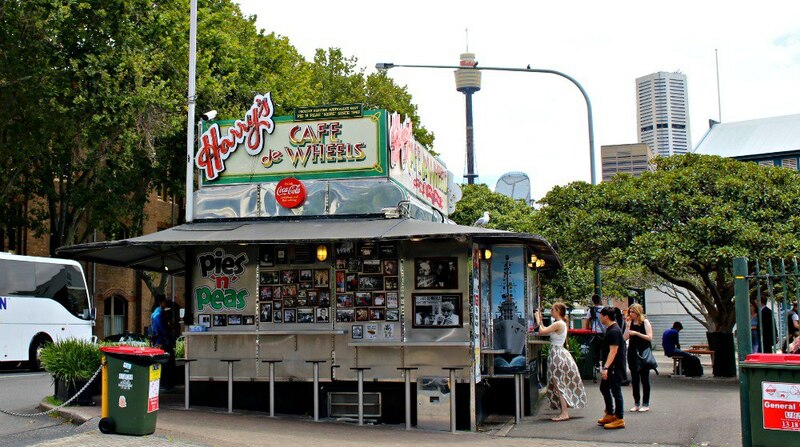 Harrys has been serving its famous Aussie meat pies since the 1930s. 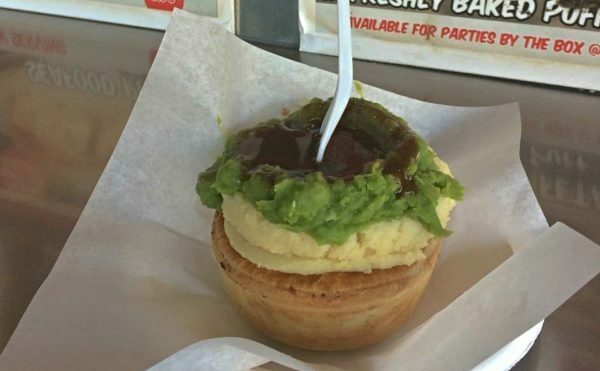 The signature dish is called Harry’s Tiger; it consists of a meat pie topped with mashed potato and mushy peas with a ladle of gravy on top. The much-loved business is included in the National Trust Heritage list. There are several franchises in the city including one in Haymarket and another at Bondi. Once a busy working dock used by traders and later cruise liners today the Finger Wharf at Woolloomooloo is home to fine dining restaurants, a marina, apartments for the rich and famous, including Russell Crowe and a 4.5-star hotel the Ovolo Sydney. Along the waterfront around the wharf are various significant artworks from Artbank – which has a gallery across the road if you fancy stopping in for more art. Detour: From here you can either continue walking into the city by taking the stairs to the Botanic Gardens and rejoining the bus in Park Street. If you want to continue to Barangaroo, cross the road directly opposite the wharf and wait for the 311 bus which runs every 20-30 mins. 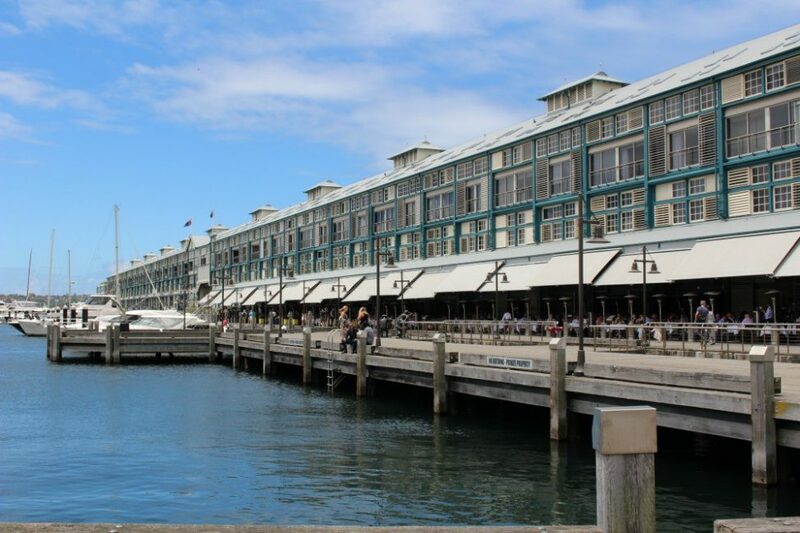 If you have just missed the bus, you can kill some time in one of the two pubs near the bus stop, the Tilbury and the Woolloomooloo Bay Hotel. The bus ends its journey at Argyle Street in Millers Point right by Sydney’s newest park, Barangaroo. 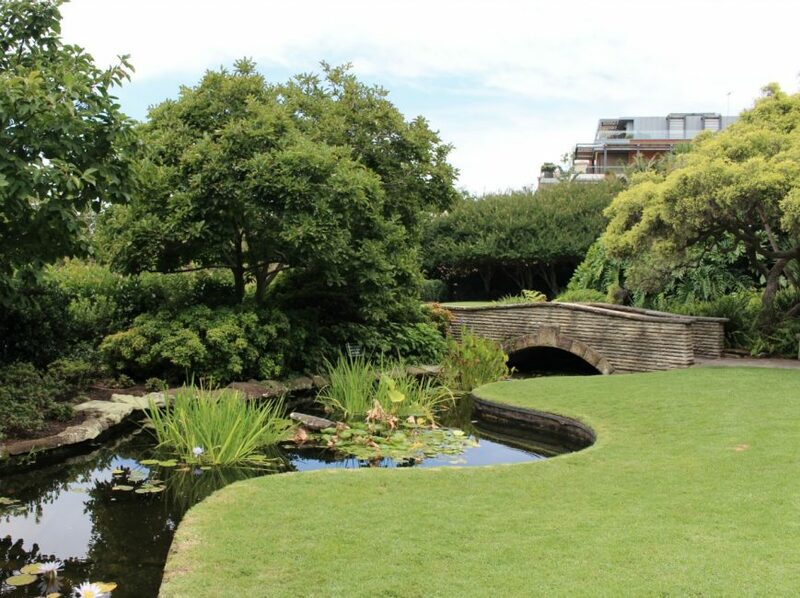 A visit to this park is an excellent way to end your day and see the harbour from a new angle. It’s ideal for an afternoon visit as the sunsets to the west over Darling Harbour and the Anzac Bridge. The bus stops near the Rocks end of the Park. When you have walked through the park, you can either retrace your steps back to The Rocks or follow the signs to Wynyard Station and bus stops. The 311 bus runs every 30 mins between 6 am and, at least, midnight seven days a week. 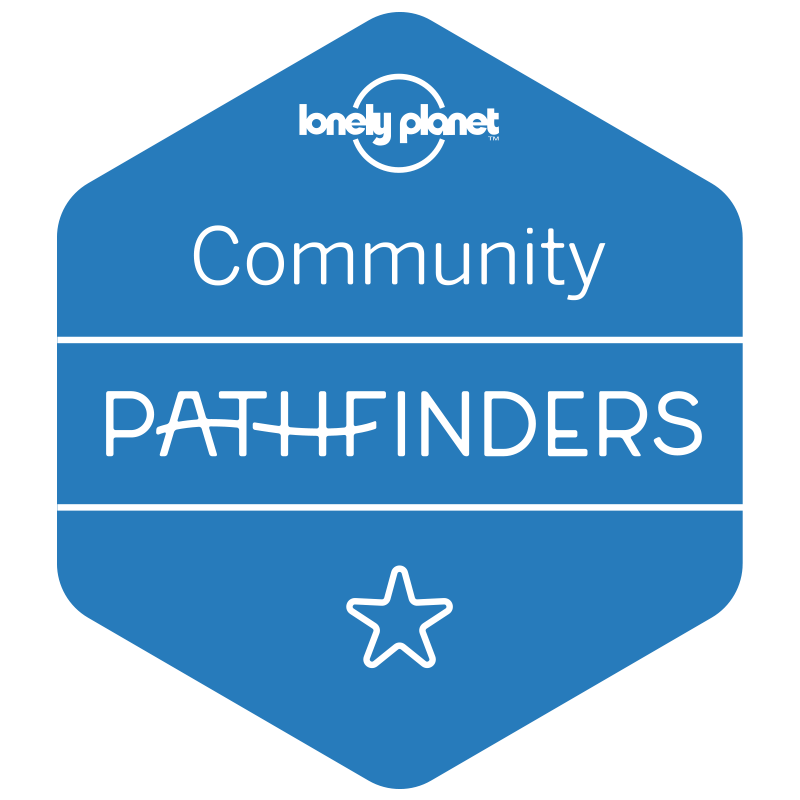 Would you like free help planning your trip to Sydney? Join the Sydney Expert Facebook community where you can ask others how have been, or live in Sydney questions, stay up to date with what’s going on in the city and meet a group of friendly locals just waiting to share their advice! 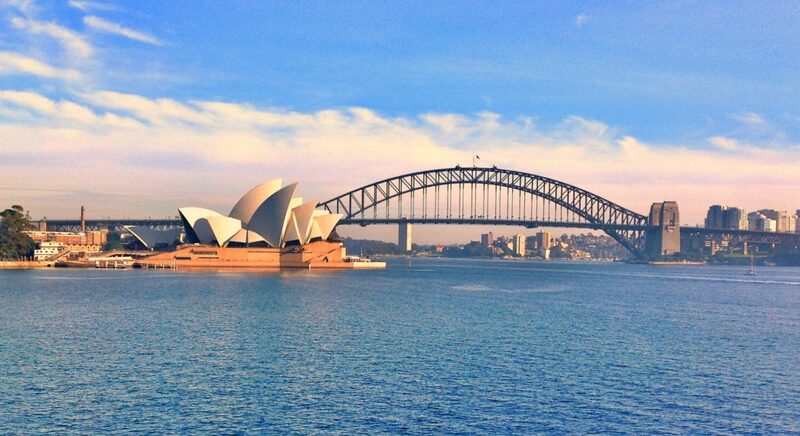 Great insights from a local’s perspective and a great alternative take on discovering Sydney. BTW, a chilli dog at Harry’s Cafe de Wheels is a must! Chew away and check out the dozens of celebrity photographs! Thanks Silke. I have not tried a chilli dog at Harry’s but will make sure I do next time. Next time you do one of these trips can I come? David hates public transport and I love it. Absolutely! I have several planned. Any are you would like to explore? 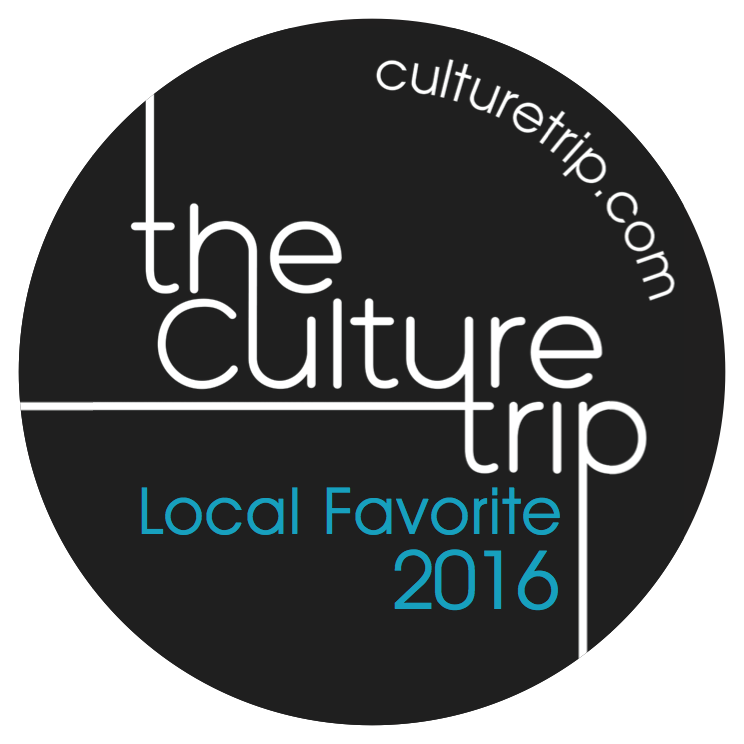 Buses can be overwhelming when visiting a city so it’s great to have local tips like this! Good idea! I left Sydney while they were still building Barangaroo. I’ll make sure I visit it next time I go, it looks great! I agree Eloise, I rarely venture on buses in other cities unless I have picked up some tips from a forum or blog. Hopefully, this will encourage people to try a few buses in Sydney. i wish public transport was that good in texas! Some locals complain but I think we are really lucky with our public transport in Sydney. I have not visited Texas but my experiences in the USA suggest it can be challenging there. Paula, I am in awe of your post. This is such a comprehensive and consuming guide. Sometimes, coming to a new city and using its public transportation feels intimidating. Did I miss the stop? What is the next one? Should I even take this bus? There are so many questions that go unnoticed by locals, but, pardon the pun, throw visitors under the bus. By explaining every little detail along the bus route, your guide gives a so needed peace of mind. Speaking of landmarks along the way, the fountain looks amazing. It reminded me of a dandelion’s head with its downy tufts. The Australia’s first apartment building sure has close relatives on the East Side NYC. I have to admit my husband is a bus driver here in Sydney so I have a lot of inside knowledge 🙂 We try to use public transport whenever we travel too because I think it’s one of the best ways to get a local view of a city. Great to see another public transportation enthusiast (ha, whatever the right word is). Absolutely agree with you – this is the best way to immerse in any new environment. Happy travels! What a beautiful fountain! It looks just like a dandelion. And I love this idea of a DIY walking/bus tour. It makes me wonder if there is anything similar here in Orlando. Thanks for the post! I think the fountain design was eventually named dandelion and went on to inspire many more similar designs. Perhpas you can write something about using public transport in Orlando. I managed to even use a few LA bus routes for walking tours so it can be done! Does the 311 turn around and go back the way it came? Or does it meander in a loop? i.e. how do I get back to Finger Wharf from The Rocks? Dumb question, I guess.